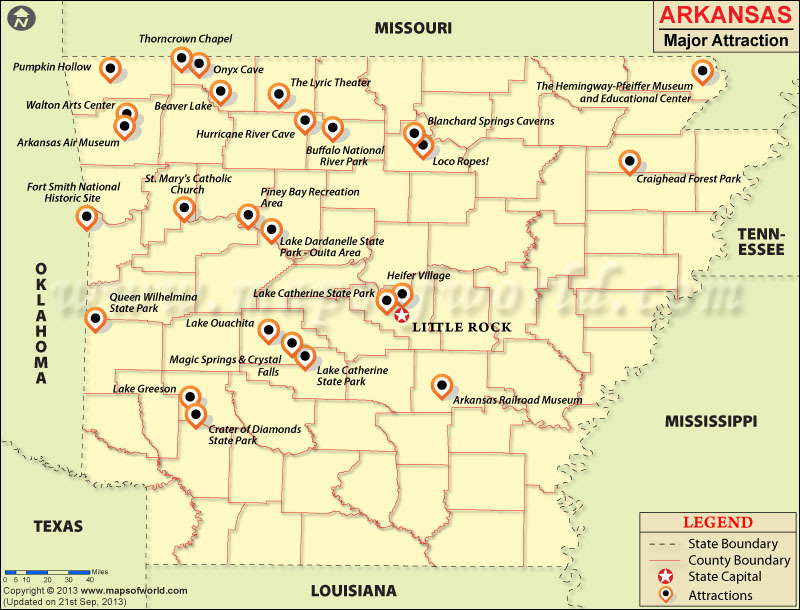 Arkansas has the country's first National River and more than a dozen Wilderness Areas, totaling around 150,000 acres. National Park Systems Buffalo National River, Arkansas Post National Memorial, Hot Springs National Park, Pea Ridge National Military Park. Museums Arkansas Inland Maritime Museum, Arkansas Sports Hall of Fame Museums, Old State House Museum, Historic Arkansas Museum, Arkansas Air Museum. Historical Places El Dorado Downtown Historic District, Fort Smith National Historic Site, Little Rock Central High School National Historic Site, President W.J. Clinton Birthplace Home National Historic Site. Other Places Delta Cultural Center, Lepanto's "A Painted House", Heifer Ranch, Magic Springs/Crystal Falls, Garvan Woodland Gardens. The Mammoth Spring State Park is located in Mammoth Spring, Arkansas. It has a hydroelectric dam, a train museum, a playground, and is surrounded the state's largest spring, the Mammoth Spring. It was established in 1957 and is a National Natural Landmark. Buffalo National River is more than 150 miles long and is managed by the National Park Service. It was the first National River to be designated in the United States. It flows through Newton, Searcy, Marion, and Baxter Counties and includes nearly 95,000 acres of land along its corridor. It originates in Boston Mountains of the Ozarks. The upper section of the river is designated a National Scenic River and a National Wild River. This area is a popular camping, canoeing, and fishing destination. Arkansas Air Museum is located in a hangar at Fayetteville's Drake Field. It was the first museum to be dedicated entirely to aviation history. It occupies the oldest aviation-related structure still present in the Northwest Arkansas. The hangar was built during the World War II. In 1986, a group of people along the Marilyn Johnson, the chairperson of Fayetteville's state Sesquicentennial Committee, founded the Arkansas Air Museum. The Fort Smith National Historic Site is located in Fort Smith, along the Arkansas River. It is a United States National Historic Site and was established in 1961 to protect two 19th century US military forts. The historic courthouse and jail building have been recently restored and now has a visitors' center. Along with a bookstore and an auditorium, it also has numerous exhibits and videos focusing on U.S. Deputy Marshals and outlaws, Federal Indian policy, and the Trial of Tears.